Founded in 1994, we are a business innovation company helping develop strategy, manage new initiatives, and foster entrepreneurial action. Clients frequently engage us for assignments of strategic importance on which we work closely with their top executives and managersCEOs, vice presidents, product managers, and program directors. We work with entrepreneurs, mature businesses, non-profits, and foundations across a wide spectrum of industries. In many cases, clients outsource managerial responsibilities to us that would normally be assigned in-house; we have an excellent track record in these engagements. The company’s work is founded on a unique compilation of research in entrepreneurship, innovation, product development, and competitive strategy. Since 1996, Dave Lash has worked with leading entrepreneurship thinkers and educators to uncover patterns of entrepreneurial success and develop business tools and resources based upon them. Dave is the creator of The Enterprise Project, a research and dissemination initiative. Our origins are in leading interdisciplinary project teams to envision and implement new strategies and products that leverage technology, from Web-based and enterprise tools to energy and building technologies. We frequently help foster collaboration between business and technical staff. Adhering rigorously to numerous cycles of design, testing, and evaluation. 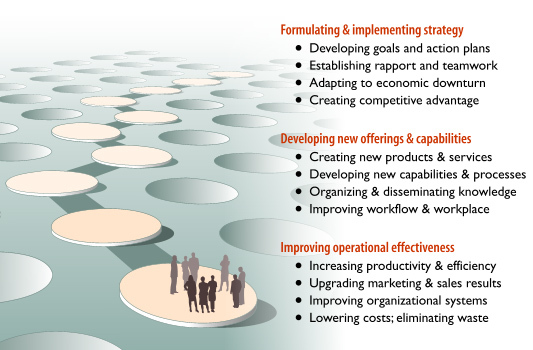 The complexity and uncertainty inherent in many strategic initiatives make visual models particularly useful. Accordingly, they are a crucial part of our approach. We develop graphical ways to present data, concepts, markets, processes, relationships, and strategies. These tools are powerful ways of translating specialized knowledge within a interdisciplinary team, evoking collaborative thinking and creativity, and explaining concepts and plans in compelling ways. Our system of “working visually” receives consistent praise from our clients. Location We are located in Hamilton, Massachusetts, 30 miles north of Boston and Cambridge. Client list - from small and mid-size organizations to the likes of MIT, Massachusetts General Hospital, United Technologies, and the Kauffman Foundation.